Our integrated design and build services provide clients with physical structures customized to achieve their goals and dramatically enhance user experiences. In addition to designing a structure, space or event, we also bring to bear a number of off-the-shelf items and partnerships to create a heightened user experience. ​The Living Room Station was our response to Downtown Improvement District (DID) and Metro Transit's interest in testing temporary, experimental prototypes for addressing needs of transit-waiting areas in the downtown public realm. In partnership with Onyx Cycle, The Musicant Group redefined the bus stop on 6th and Nicolet by creating The Living Room Station—a comfortable, inviting, and fun place for the thousands of people who wait each day and help enjoy their commute and time in Downtown. The true sign of success was the riders’ joy, positive attitude, buy-in, and support that snowballed into a culture of community and connection that has never been created at any other Minneapolis bus stop. The Musicant Group helped to design a parklet to celebrate the redevelopment project planned for 29th street. Our group hosted activities to transform 29th street, turning parking spots into temporary public parks, installing bike parking, and this parklet to enjoy the space and community around 29th street. (right) The Musicant Group commissioned and co-designed the 29th Street parklet from ThreeSeven Design. We create fun and novel ways to engage and play in the public realm. From traffic signs repurposed into ping pong tables and bag toss sets to giant checker and jenga sets, these games create lasting memories for visitors to our places. During consecutive summers, The Musicant Group transformed two vacant lots adjacent to busy transit facilities. 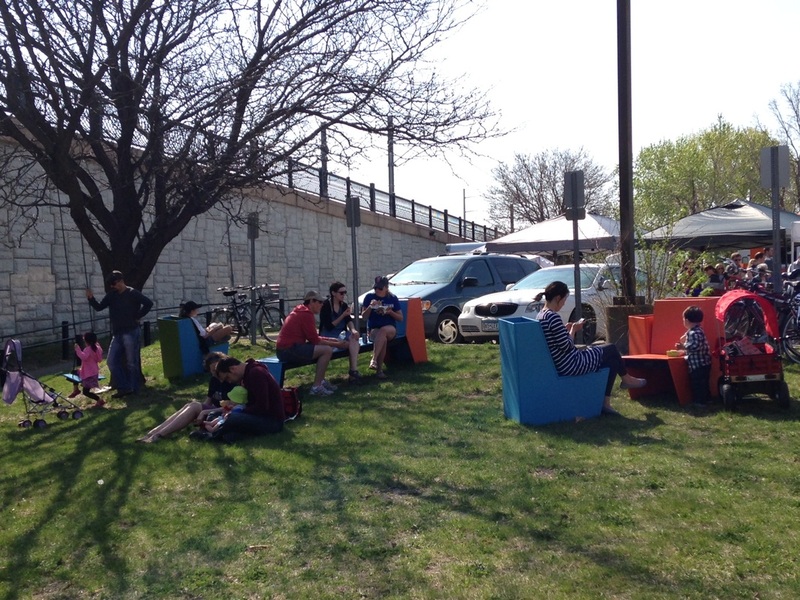 In 2014, The Musicant Group commissioned new comfortable seating, a tree swing, and a ping pong table for the vacant lot next to the busy bus stop at Penn Avenue North and Plymouth Avenue. These additions transformed the waiting experience for riders and was done as part of a partnership with Hennepin County Community works. In 2015, these facilities were then relocated to one of the busiest transit stations in the system at Lake Street and Hiawatha Avenue. The furniture was joined by an outdoor skeeball set and moveable seating, both of which utilized the natural slope of the new location. The Musicant Group commissioned and co-designed each piece of furniture with Silver Cocoon Design and ThreeSeven Design. Snow can be sculptural and invite activity. 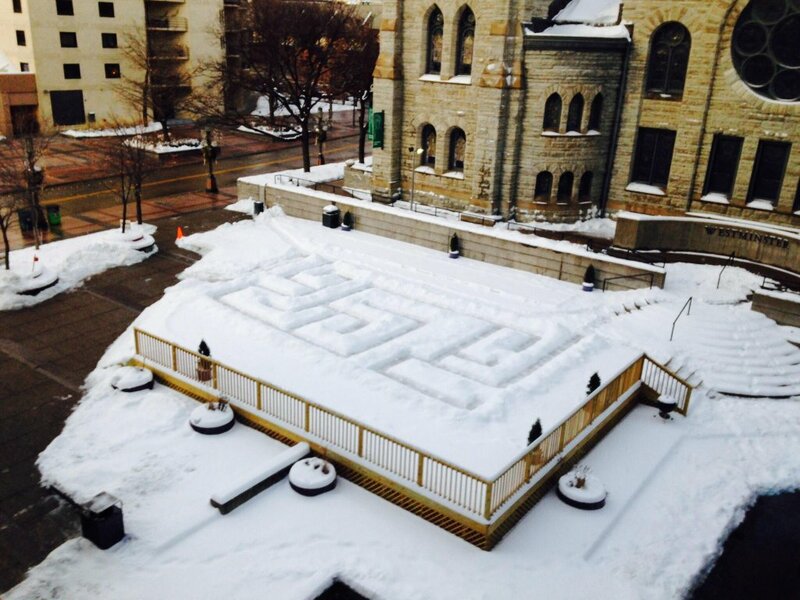 During the particularly snowy winter of 2013, The Musicant Group designed, built (or rather shoveled) and maintained the largest known snow maze in the City of Minneapolis for our Piazza on the Mall Project. The Musicant Group designed and built the Snow Maze. 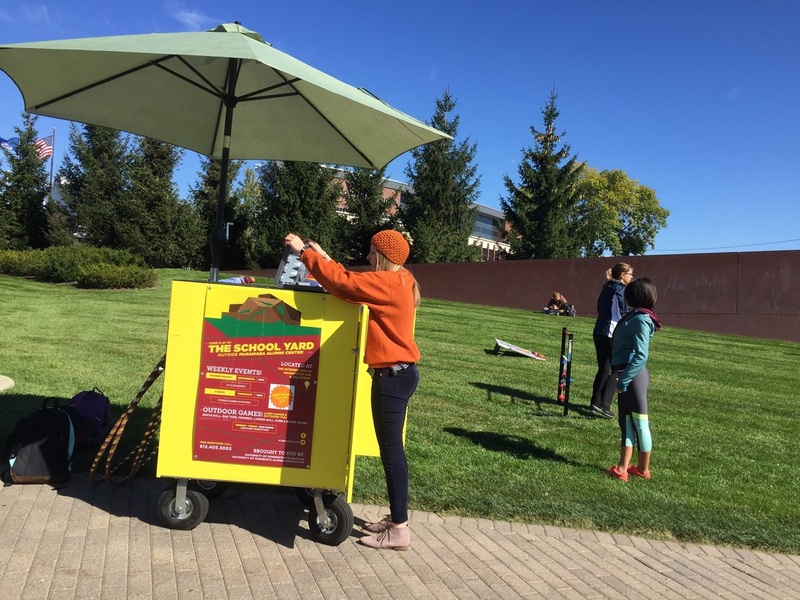 For The School Yard: Outside McNamara Alumni Center, The Musicant Group conceived of and co-designed a game cart to house a variety of free lawn and board games available 5 days a week for anyone who visits the space. It was a successful and iconic installation at the site with visitors and other U of M groups who often want to borrow it. However, it stays on site for The School Yard attendees to enjoy, especially on a warm summer day. The Musicant Group commissioned and co-designed the game cart from Willie's Woodworking. In the winter time at the Piazza on the Mall, The Musicant Group created the first urban curling court in Downtown Minneapolis on Nicollet Mall. This free curling court offered real equipment to try out and the chance for the community to have lessons with Olympian Curler John Shuster from Duluth at the Piazza's Holiday Hot Haus event. Up for a game? As part of our Piazza on the Mall project, we created a miniature bocce ball court replete with edge borders and plenty of balls. These could be seen used late into the evening and were very popular with little kids. The Musicant Group commissioned the bocce ball court from ThreeSeven Design. For a variety of our block parties and community events with a purpose, The Musicant Group has partnered and created a variety of temporary bike lanes to enhance the biking passageways and access during these gatherings. The temporary bikeways help envision and showcase what a more permanent bike lane would be like on the event streets. We encourage public realms to look at ways to enhance the bike and pedestrian experience and accessibility. This creates healthier communities and increases economic development for the user to be out walking and biking, especially in business districts and main streets. King me! The only thing better than a quick game of checkers is a quick game of giant checkers. This set, as part of The Piazza on the Mall, was a hit with kids and adults alike, with gallery seating providing great site-lines for spectators. For a variety of our events, sites, and projects, The Musicant Group has provided and encouraged food trucks to come and enhance the area with access to food and beverages for nearby tenants, passerby's, and attendees. These food trucks are located on sites where they won't compete with nearby locations, but will benefit all. Food trucks are a great way to bring people out and enjoy the smells, tastes, and gathering space that this mobile installation will create. Little Box Sauna (LBS) teamed up with The 612 Sauna Society and The Musicant Group to bring the Nordic sauna experience to the Piazza on the Mall. For some winter placemaking, community members were invited to join The 612 Sauna Society for weekly open sauna sessions. The sauna sessions sold out very quickly. On Fridays, there was special programming for the public of: campfires, live music, storytelling, fire performance, and community singing. The Little Box Sauna was sponsored by the Westminster Presbyterian Church and was conceived, designed, built, and deployed as an experimental Creative Placemaking project by Andrea Johnson and Molly Reichert.